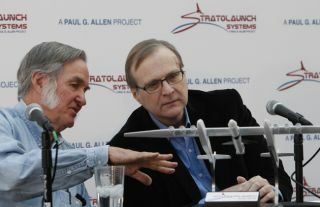 Microsoft co-founder Paul Allen, right, confers with airplane designer Burt Rutan during the 2011 unveiling of the Stratolaunch concept. And in December of 2011, Allen and Rutan unveiled a new company called Stratolaunch Systems, which aims to air-launch satellites using a gigantic plane. This craft is the largest airplane ever built, featuring a wingspan of 385 feet (117 meters). "Mr. Allen's financing of the Tier One project that won the Ansari X Prize with SpaceShipOne led to broad investment in a new generation of space-technology entrepreneurs," the nonprofit Commercial Spaceflight Federation said in a statement after Allen's death. "He was passionate about pushing the innovation envelope and motivating achievements beyond what was initially envisioned, ultimately for the betterment of humankind. Mr. Allen's pioneering entrepreneurial spirit will live on as we continue to surpass space technology milestones in his memory." Then, there are Allen's contributions to the SETI effort. He provided the seed money for the Allen Telescope Array (ATA), a 42-dish network in Northern California that listens for possible signals from alien civilizations. Allen eventually donated more than $30 million to the ATA project, officials with the SETI Institute in Mountain View, California, have said. "Sadly, Paul Allen passed away this afternoon. I'm sorry that he won't get to see all the things that the Allen Telescope Array will [yet] do," radio astronomer and SETI Institute co-founder Jill Tarter said via Twitter yesterday.